The shelving that Northfiled Historical Society (NHS) used before the project was basic. It allowed for storage of items in the collection, but it contributed to their deterioration as well. There was not enough shelving, some of it was made of unsealed, off-gassing wood, and there was no room to expand the shelving to accommodate a growing collection. The vendor selected used computer aided design (CAD) software to maximize the amount of storage space in a non-standard historic space. It's "Invite Congress to Visit Your Museum Week"
Kiosks in Museums: Win, Lose or Draw? Do Cultural Tourism Sites Always Need New Attractions? National Park Service seeks a qualified candidate for its Supervisory Exhibits Specialist position at the New Mexico Bandelier National Monument. Deadline: July 25, 2014. Minnesota Historical Society seeks a qualified consultant to develop and implement an education and communications strategy for MNHS’ historic preservation endeavors. Deadline: 2 p.m. August 7, 2014. MONTANA SHPO, Helena MT, seeks a new Review & Compliance Officer. Deadline: August 4, 2014. AECOM, Trenton NJ, is looking to hire an Architectural Historian to support their North Region. Position open until filled. Kanabec History Center is seeking a qualified candidate for the position of Administrator/Curator. Position open until filled. Afton Historical Museum presents their new exhibit "Brides Through The Ages," July 17-August 28, 2014, showing our recently discovered wedding dresses of the women of Afton. Call 651-436-3500 for more information. Anoka County Historical Society, Anoka MN, will present a Century Farm Award to the owners of the Burman Family Farm at the bandshell on the Anoka County Fairgrounds, Wednesday July 23, 2014, 12 p.m. Call 763-421-0600 for more information. Winona County Historical Society, Winona MN welcomes Mike Kennedy who will explore the life and legacy of John Latsch on Thursday July 24, 2014 at 7 p.m. While there, view an exhibit highlighting artifacts from Latsch’s business and a bronze statue of Latsch with his canoe. Contact Jennifer Weaver at 507-454-2723 ext. 3 for more information. Carlton County Historical Society, Cloquet MN, hosts the July Friday Movies at the Museum on Friday July 25, 2014, 1 p.m. This month features two home movies from the museum's collection--Carlton County Dairy Days, the first Dairy Days held in 1952 in Cloquet, and the 1961 Dairy Days held in Pine City. Call 218-879-1938 for more information. Historic Masonic Theatre, Winona MN, is inviting the public to view its historic stage Scenery before it goes into storage, Monday July 28, 2014, 4:30-7 p.m. Call 507-457-8258 or Email for more information. Nicollet County Historical Society invites you to find out how the Green Giant Company and Cosgrove Family relate to the historic W.W. Mayo House through a "Giant Story" Tour of the 1859 Mayo Home, August 1-3, 2014. Call 507-665-3250 for more information. The Bloch Party at the Historical and Cultural Society of Clay County on Sunday August 3, 2014 from 11 a.m. to 4 p.m. is a celebration of the Bloch’s journey though North Dakota for its North American Tour. There will be live entertainment, interactive art projects throughout the day, woodcarving, printmaking, Swedish Dala painting and ceramics. For more information visit their web site. Steele County Historical Society, Owatonna MN, announces a ribbon cutting ceremony for Gus’ Station at the Village of Yesteryear, on Thursday August 7, 2014 at 10:45 a.m. Free. The public is invited to attend. Call 507-451-1420 for more information. The Anoka County Historical Society, Anoka MN, invites the public to attend the MN Ghosts of Anoka Walking Tours, Thursdays and Saturdays, August 7, 9, 21 & 23, 2014, 7:30 p.m. Starting location: Anoka County History Center. Advanced reservations required. Cost: $7 Adults, $5 Youth, $5 ACHS Members. Call 763-421-0600 for more information. Nicollet County Historical Society, St. Peter MN, hosts author William Lass, who will talk at Fort Ridgley State Historic Site about his new book, “Shaping the North Star State: A History of Minnesota’s Boundaries,” Saturday August 9, 2014, 2:00 p.m. Cost: $5 for adults, $3 for seniors. Call 507-665-3250 for more information. Pond Dakota Heritage Society, Bloomington MN, hosts Barbara W. Sommer, co-author of The Oral History Manual, who will lead a discussion of oral history and oral traditions, Sunday August 17, 2014, 2 p.m. Suggested donation $2. LeDuc Historic Estate, Hastings MN, hosts author Fred Johnson who will speak on The Seawing Disaster of 1890. Visitors are encouraged to attend the 6:30 p.m. concert with music by The Squires, Sunday August 17, 2014, 5 p.m. $2 donation appreciated. Call 651-437-7055 for more information. Preservation Alliance of Minnesota, St. Paul MN, announces that the Historic Pub Crawl Series is back and paying a visit to the West Bank and Cedar-Riverside neighborhood, Tuesday August 19, 2014 6-9 p.m. Cost: $10/person. National Trust for Historic Preservation announces conference registration is now open. The conference returns to Savannah GA November 11-14, 2014. Early Bird Pricing ends August 15, 2014 Additional information. Register for the IRS July 24, 2014 webinar "How to apply to be tax-exempt (including new Form 1023-EZ)." 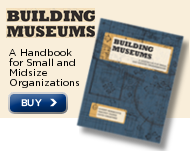 The American Alliance of Museums offers a step-by-step guide to connecting with your legislators August 9-16, 2014 while Congress is in recess and members are back home for state and district work. The grant program is offered to assist communities and scenic byway organizations in attracting travelers to Minnesota. Check out this surprise donation at Otter Tail County Historical Society. This is a good reminder that one strength of a local history organization often rests upon its collections management policy. Such policies should describe the criteria by which an object can be accepted for permanent preservation to guide both donors and collections committees. Minnesota Mysteries by Ben Welter.